The recent flooding in Cumbria and other parts of northern England have provided some striking images. The connection between deforestation and flooding is well recognised, providing ample reason for more woodland in the uplands. The recent flooding in Cumbria and other parts of northern England have provided some striking images of devastation. Having experienced flooding myself in the past, I am profoundly sympathetic towards the unfortunate people who have had their homes flooded. It really does create a horrific mess, and irreparably damages the majority of household items, such as carpets, furniture, electrical goods and food. The damage to houses means having to replace flooring and re-plaster walls. The quantity of rain falling in a short time would challenge any catchment, but the absence of tree cover in the hills is a major factor in the flow of water off the hills, destroying roads on the way, and the extent of flooding in the valleys. This weekend broke the rainfall records (since 1860). This year is a strong El Nino, possibly the strongest on record (since 1950), which is related to variations in ocean currents. El Nino makes the air warmer so it carries more moisture. Coming across the Atlantic from the Caribbean, the moist air meets the hills in the west of Ireland and Britain cooling the moisture content which falls as rain. The connection between deforestation and flooding is well recognised in other countries. 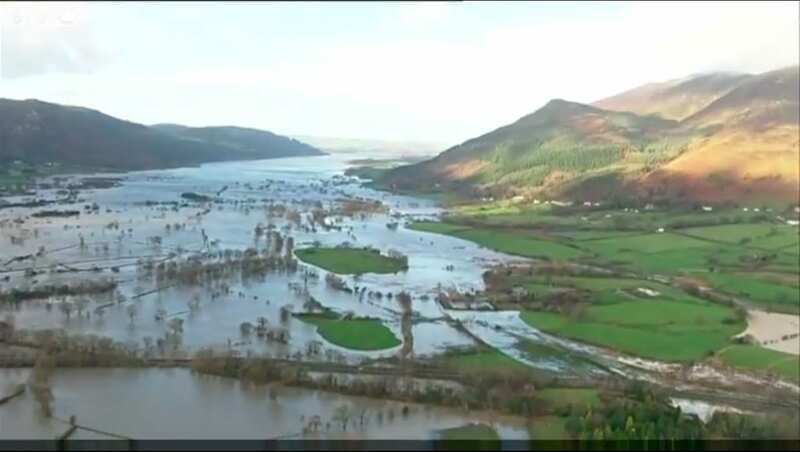 Here in Britain we seem to be surprised that our deforested landscape is prone to flooding. However, this is the natural consequence of rainfall on treeless hills. Woodland slows the passage of rain to the ground, and enables the soil to absorb the water, which is then released more gradually over time. Our woodlands were initially cleared to make way for agriculture, which in the uplands means mainly livestock grazing. The continuing presence of sheep ensures that no tree regeneration can take place. The effect of heavy rain on treeless hills is made even more dramatic by land drainage, that purposefully reduces the amount of water stored in the soil and quickly takes it to the rivers. Finally, the compaction of the soil by livestock, and in particular sheep which apply greater pressure in pounds per square inch than other animals, means that rain cannot percolate into the soil and instead runs over the land surface straight into rivers. 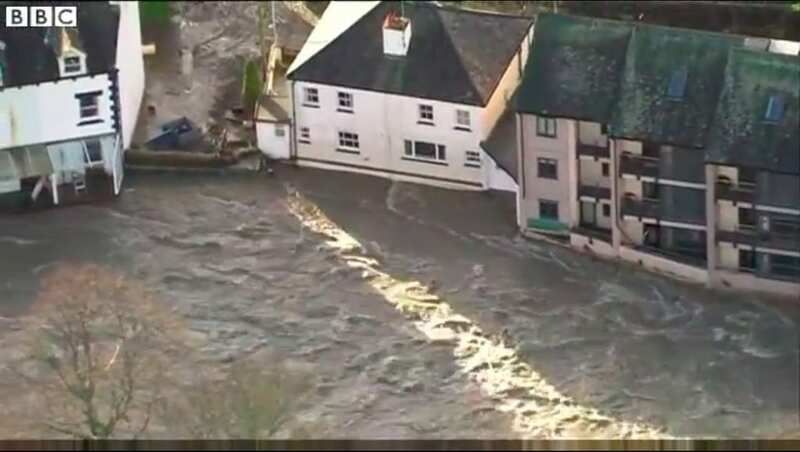 This is why the valleys flood so readily, and this is what causes the terrific damage to towns and infrastructure of the kind we have seen this weekend in Cumbria. The thing is, this is not news even here in Britain. There have been plenty of scientific studies demonstrating the facts and it has been widely reported in the past. But there now seems to be deliberate suppression of the information, with little mention of it in the media and government even deleting a report from the internet. For more on this, see George Monbiot’s recent article. The first picture in the gallery shows the deforested hillsides of Cumbria, the cultural landscape that is apparently so valued, according to National Park Authorities. And it shows the valley full of water after the heavy rainfall. 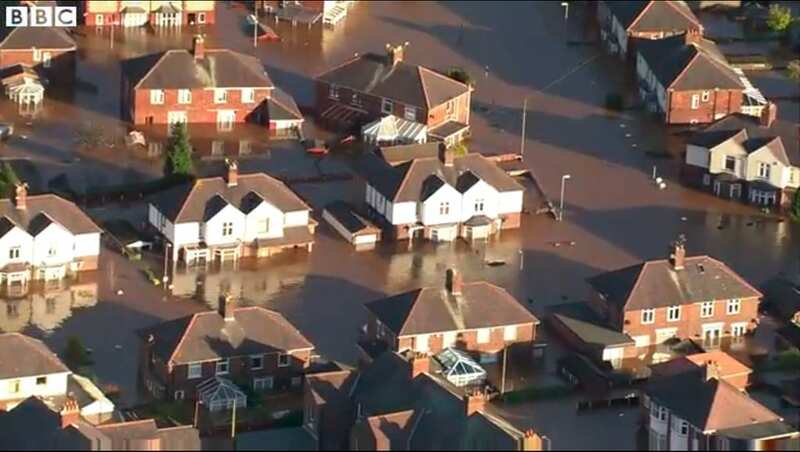 The other pictures show the effect of the floods in Carlisle, the main city of the region. 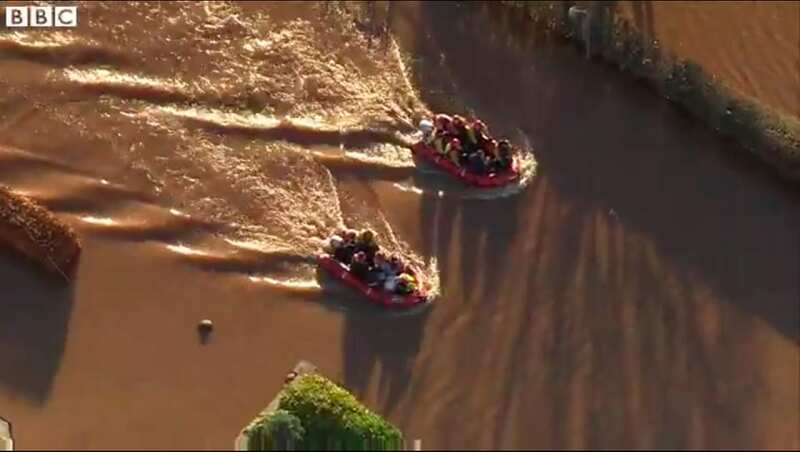 The pictures are taken from BBC footage from a helicopter flight over the region on 5th December. I agree that sheep farming is part of the cultural heritage of the British uplands, and have no reason to criticise the industry in principle, and make enemies in the farming community – some good friends of mine are sheep farmers. I agree that people value the open and accessible landscapes created by sheep. And there are cultural artefacts and traditional livelihoods associated with sheep that form part of the identity of certain regions. But I don’t agree that we should ignore the problems created by some aspects of the industry, and I do not think that this is a case of all or nothing. Sheep farming is an uneconomic activity in upland areas and only continues with the support of government subsidies. Should society should be supporting an activity that is responsible for damage and misery elsewhere? Are the benefits of sheep farming worth either the cost of the subsidies or the damage caused by flooding? Of course not – and there are other ways of doing things without needing to lose sheep farming and its cultural associations. Firstly sheep farming can be made more environmentally responsible. More trees present in sheep pastures, especially if planted strategically, can reduce water run-off by increasing water infiltration into the soil. On top of this, in the windy hill country, trees reduce wind strength and increase the productivity of the pastures. The trees also provide shelter from wind, rain and sun for the sheep. And the growth of the trees can provide an ongoing supply of woodfuel or wood chip, which can be used as bedding in place of straw. There is everything to gain for the farm business. Other things sheep farmers can do are: to stop land drainage; and to reduce soil compaction through their stock management. These simple changes will reduce flooding downstream significantly. The Pontbren study in Mid Wales provides a scientific study of a group of farms where these adaptations were put into practice. The peaks and troughs of water flow in the rivers were attenuated, meaning less flooding when it rains and less drought in dry spells. Other advantages are that the landscape is made more attractive, and there are benefits for wildlife. If pesticide use could be reduced, there would be even more benefits for wildlife, and sheep farming would start to look more like an industry acting responsibly towards the environment. The other point to make is that there should be areas which are not farmed, wild areas where nature can be left to look after itself. This isn’t an implied criticism of farming, but it is a criticism of the attitude that every part of the landscape needs to be managed and productive. Wild land is cheaper than farming sheep in the uplands – it need not involve much in the way of running costs to government, certainly nowhere near the £175 per hectare paid in farm subsidies. It will undoubtedly provide more benefits for reduced flooding and drought, plus better water quality and increased carbon storage. Wildlife will benefit. And for many people, a landscape with more native woodland is more attractive, despite the claims of National Park Authorities. The recent flooding again provides us with a substantial reason for some rewilding in the uplands. Even if there were no other benefits, there must surely be a strong case for doing what we can to reduce the flow of water off the hills and into people’s houses. I totally agree. They need to start implementing this ASAP otherwise it’ll happen every single year. Plus, I’ve always felt that the barren hills of Cumbria aren’t as attractive as they would be with some trees. An interesting and informative article. I hope that Britain’s politicians take note! In my experience, destruction of the high moss wetlands (bogs) for forestation is a root cause. Channels for drainage are dug into the moss before the trees are planted. Before, the moss acted as a massive sponge that slowly released the water but when the land is forested the rain just runs right off causing flash flooding. Of course, when the forests are cleared then the problem becomes even worse. Totally agree. Land drainage is a significant cause of flooding, whether it is in commercial forestry or agricultural land. We will be blocking the drainage grips on our site at Blwch Corog and allowing the land to revert to blanket bog, heathland and native woodland. Heavy grazing pressure has the effects of soil compaction and closely cropped vegetation, both of which contribute to surface run-off of rainwater.